Many guests admire our artwork and décor – the good news is that most of our featured artists are still at work in and around South Africa and welcome visitors-- and commissions! Katherine’s township scene above the fireplace was painted for us on commission 20 years ago when she was still in Pretoria – it has accompanied us around the world and is familiar to friends everywhere, before assuming pride-of-place in the Derwent House lounge. Fortunately, Katherine has now taken up residence in Somerset West – about 45 minutes by car along the coast – and welcomes visitors to her studio there. Like her work and want to feature in it? Just ask her! 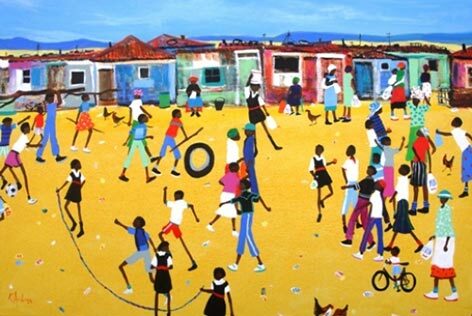 Katherine’s work portrays the texture and colour of everyday African life. She works from memory (but can also work from photographs on request), sketches, and on location, using acrylics as well as watercolour and other media. Want a splash of African colour on your walls? You’ve found it! 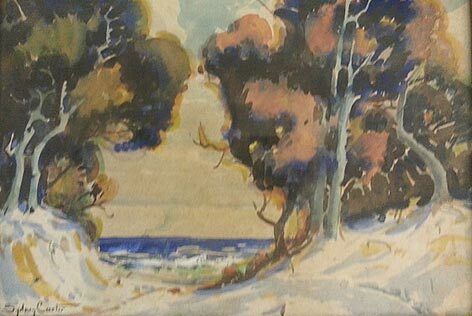 Sydney Carter (1874-1945) was an English artist who resided in South Africa for much of his life and gained renown principally for his South African landscapes and traditional rural scenes. Our Cape Dutch manor house was painted in 1937 and bought at auction in Johannesburg 20 years ago. Today, Carter’s work is sold mainly through auction houses and exclusive galleries in South Africa and around the world. We first discovered Ian’s work in Miami, Florida, hanging on the wall of a South African friend – it was love at first sight, and the first thing we did on arriving back in South Africa was to commission two paintings from him, the most dramatic of which now hangs in the breakfast area – the neon zebras watching you eat breakfast. Ian was born in Kimberley, South Africa and raised on the family farms in the district. He started drawing and painting at an early age, inspired by the immense open spaces and wild animals that were part of his daily life – but with imagination, colour and pizzazz (all the things we love!). 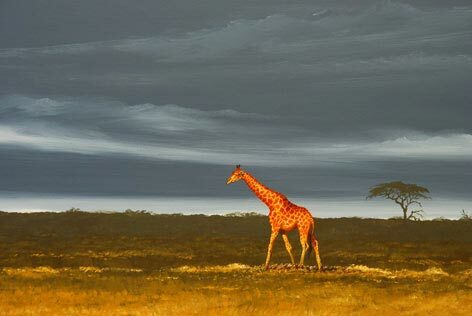 He lives and works in Umhlanga, Kwa Zulu Natal, but regularly exhibits in Cape Town, Durban and Johannesburg and has shown work in successful exhibitions in New York, Birmingham and at the prestigious auction of Wildlife Art held by Christies of London. Ian welcomes visitors to the studio by appointment and you can contact him by telephone or e-mail. Most of our traditional African art pieces come from Amatuli – the Zanzibar door in the informal lounge, the Juju hats in the stairwell and the bronze leopards from Benin . . . Proprietor Mark Valentine, who we befriended in Johannesburg in the old days, is a legend in the African art trade, regularly traversing the continent up and down in search of new treasures. 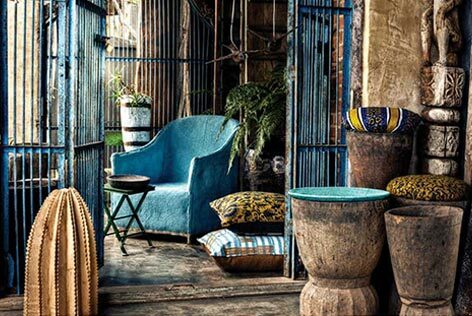 Today, the showroom in Johannesburg is warehouse-like, and much trade is done online. If you find something you like, he can ship it to you anywhere – our door came to Canada before returning here to take up its place in the informal lounge. Tell them you saw their artefacts at Derwent House! 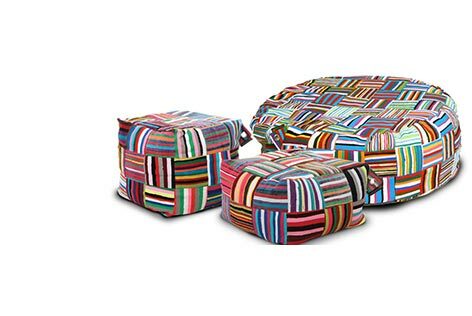 Ashanti produce a uniquely African range of bean bags, bags, cushions and other soft furnishings (like our door-stop) woven from recycled fabrics collected by impoverished communities. 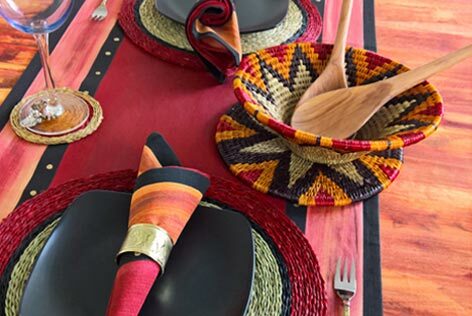 By tapping into the honed skills and traditions of rural artisans from Madagascar, Malawi, Kenya and Mauritius, they create a range of products that capture the distinct and vibrant aesthetic of the African sub-continent. Each item in the range of textiles, baskets, home-ware and accessories is handcrafted using local, responsibly sourced materials and techniques culturally unique to each region. Ashanti has their main showroom and shop 10 minutes away on Kloof Street. Carole is a South African textile artist who started her business in 1993 in her garage as a way of earning a good living doing something creative and contributing to poverty alleviation in South Africa. Her textile design style is boldly African, full of colour, shape and life – we came across her table décor, placemats and cloths in the very early days in Johannesburg and were hooked. Everything is handmade, both hand-painted or hand-printed. You will find her textiles in the breakfast area and in various rooms – today her range encompasses fabrics and all kinds of soft furnishings and home décor. She has a shop at the V&A Waterfront where you can see and feel the products, but also has a very active an efficient online shop from which you can order worldwide. 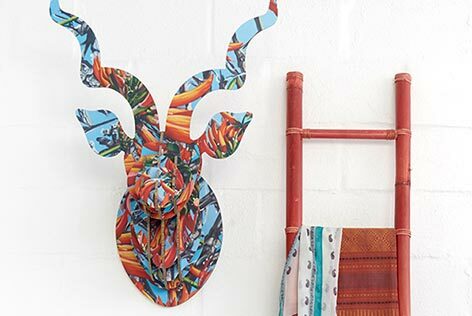 From bamboo and printed kudu heads, to freestanding animals in recycled board, each sculpture is carefully designed, hand crafted and then machine cut to get a realistic 3-dimensional form. Head On Design’s products offer style conscious customers modern sculptures for contemporary spaces. Head On Design supports the conservation of our wildlife, and has our pre researched, promoted and donated to organizations that are doing great work to protect cious natural heritage. Joanna has a stand in the Watershed at the V&A Waterfront where you can see and feel the products, but you can also order directly online for shipping anywhere in the world. 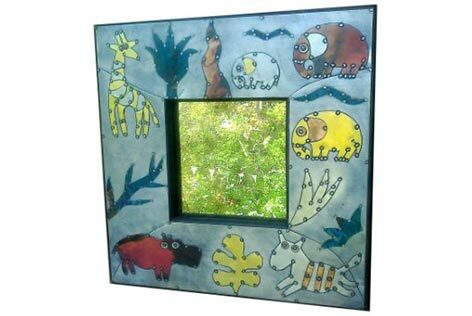 Cape Town artist, Sue Jowell, produces individually handcrafted mirrors, wall art, key racks and custom-made functional crafts. Her themes are African in design, influenced by the art and craft of Tuareg from northern Africa and the Ndabele further south. She works and sells from her studio at her home in the leafy suburb of Clovelly, near Fish Hoek on the way to or from the Cape Peninsula. Sue welcomes visits to her studio by appointment and is happy to take on commissions, subject to availability. 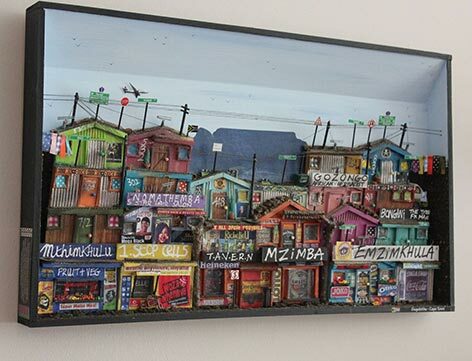 From the Garden Route town of Knysna come these beautifully hand-crafted collages made of recycled tin and other materials, recreating township scenes around Cape Town in meticulous detail. Each piece is unique and entirely the creation of the individual artist. We found this one in a friend’s home in Pretoria – and having admired it, were later presented it as a gift! Contact Metamorphosis above for commissions or to order (steve@cyberperk.co.za) – Made in SA at the V&A Waterfront also stocks a few pieces. Lumela Afrika (Lumela meaning hello in the Sotho language) is a job creation project focusing on the employment of single mothers but also men from the local townships of Sharpeville, Sebokeng and Orange Farm. 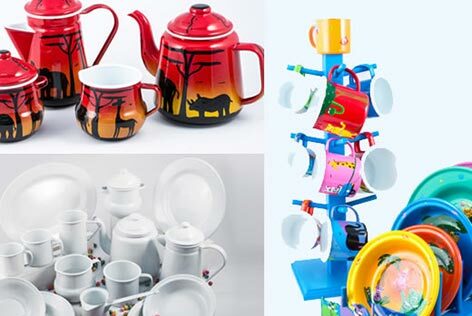 The Lumela range consists of both functional and decorative items – these are the tin mugs in your room. They produce a diverse range of products – most of which are hand crafted and painted, making each product unique in its own right. Lumela, however is not just about bright, fun products - it is essentially about empowerment and upliftment. Their mission is to continue to positively change the lives of our local men, women and children, through sustainable employment as well as ongoing support to more children’s homes. All paints used are SABS approved, non-toxic and lead free. You will find selected products at souvenir and handicraft shops around Cape Town—the Biscuit Mill has two shops selling their products, but for a larger range and/or specific designs, contact them directly.